Family Travel: Things to do with kids… close to Houston… and far from Houston! Everywhere I go, I have an entourage. Whether I’m exploring Houston or another city, I have 4 kids in tow. We are not good at sitting back and relaxing, so let me share what we’ve found to do in cities around the United States… and Beyond! Texas Roadtrips: Pack up the family and head towards Austin, San Antonio, Corpus Christi or Dallas… and stop at these parent recommended spots! Camping Near Houston: Parent recommended spots for camping with kids! Splashway Campgrounds: Year round camping and cabins. Go in the summer for the waterpark! Thousand Trails Colorado River: Camp or glamp on the Colorado River! Thousand Trails Lake Conroe: Camp or glamp on Lake Conroe! Brazos Bend State Park: Camp out close to Houston! The Tipis at Geronimo Creek Retreat: Not Camping… but Glamping in a Tipi! The Antlers in Kingsland: Sleep in a caboose! Mayan Dude Ranch in Bandera: Ride horses, float down the river… and be a cowboy for the week or weekend! The Woodlands Resort: An Amazing Family Vacation… Just 30 Minutes Away. Galveston: Whether we are looking for a beach, museum, park or restaurant, the small Galveston Island has them… and they are easy to get to! Here are the places we’ve visited with kids (and not just a laundry list of things to do). Beaumont: Two days in Beaumont? We have things to do with kids! Port Aransas: Big beaches, dolphins, sea turtles and more! Here are our favorite things to do in Port Aransas! Lake Charles/Sulphur, LA: The Lake Charles and Sulphur area is rich with culture, history and heritage of the Cajun/Creole people. Almost every month of the year there is a festival or a parade… plus museums and parks! Here are recommendations from Ashley! Roadtrip Along I10… Things to do in Louisiana, with kids: Check out these stops, from west to east, across Louisiana. Bozeman, Montana & Yellowstone National Park: Just think of fleece jackets, almost no mosquitoes, cold lakes, beautiful mountains and big blue skies. Tips for visiting with kids! Scottsdale, Sedona and Grand Canyon: Hikes (for non-hikers), Trains, Horseback Riding and More. I never thought I would say this, but I loved our trip to Arizona. Lincoln, Nebraska: I moved out of Lincoln when I was little, but I went back regularly to see my grandma until college. I used to tour the Lincoln zoo, museums and parks with my grandmother… and now I take my kids to do the same. Last time we were there, my dad said, “I do not regret moving around, but Lincoln is a really good place to be.”. I agree… and my kids are counting down the days to the next trip! If you are looking for things to do in Lincoln, here are our favorites! Western New York: Niagara Falls, Lewiston, Lockport, Olcott & Great Lakes. I thought a trip to upstate was a trip to the country, with no city to explore and nothing to do. And much of it is “the country”… but once I started actually looking around, I found a place that was perfect for a family vacation. Relaxing pace but lots to learn, and a lot that is different than our hometown of Houston. Southern Tier New York: You know that I’ve spent a lot of time in Western New York, but this time we took the family to New York’s Southern Tier. So instead of being at the very top of the state (and top of the United States), we were in the beautiful region near the Pennsylvania boarder. San Diego: Many years ago, I was a Navy wife in San Diego. And for the decade that followed, I traveled from Houston to San Diego every few weeks for work. And when I was especially lucky, I would take my kids with me. My friends often ask for tips for where to visit on their San Diego vacations, so let me share my favorite spots from a (used-to-be) local mom! Disney World: Since I’ve had kids, I’ve been thinking about taking them to Walt Disney World. And I just keep thinking about it because I don’t know where to start with planning the perfect trip. If we are going to spend the money and haul everyone to Florida, I want it to be magical… and lucky for us, here are the tips from a Disney expert! Paradise Island, Bahamas: Blue skies, clear water, exciting water slides, dolphins, sharks, pools… How we did the Atlantis Resort for not so much money! Taipei, Taiwan: I love love love Taipei and have always wanted to take my kids. 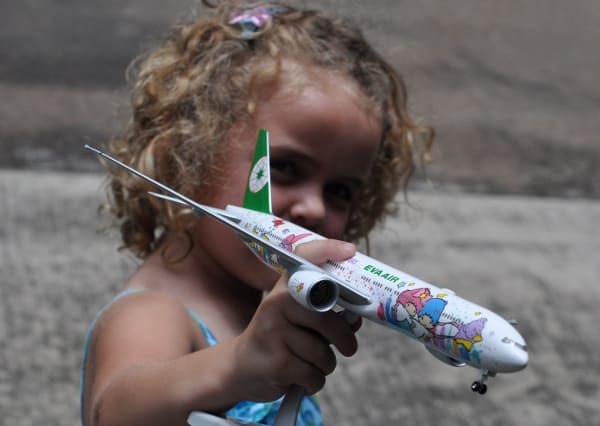 Well now EVA Airlines has a direct flight from Houston to Taipei, on a Hello Kitty Jet, and Houston mom Angie took her kids and told us all about it! Aquatica Suite at the Omni San Antonio at the Colonnade: The coolest room we’ve ever seen for kids. Look at the pictures! The Woodlands Resort: You need to see the pools. This is an amazing family getaway. Embassy Suites The Woodlands: Right in the middle of Hughes Landing, with a sleek modern design, staff that is welcoming to business travelers and families, and a rooftop pool with a view of all the Hughes Landing activity. Omni Houston at Westside: Take a look at the Omni Kids Activities! Marriott at IAH: This funny looking building is sleek and modern inside. And, whatever they have done to sound proof it, really works well. Lake Houston Wilderness Park: The wilderness, right by Houston!